In a new report, researchers from environmental think tank Resources for the Future (RFF) found that despite the recent downturn in commodity prices, about 82 percent of local governments across five U.S. shale regions still positively benefited from oil and gas activities. Notably, researchers found that the “net fiscal benefits” for many of these local governments has even improved in 2016 and 2017 compared to 2013 through 2015. To assess the fiscal impact of of oil and gas development on localities following the decline in oil prices, the authors built upon interviews with “hundreds” of local officials taken from 2013 to 2015 across 16 states. The authors then revisited five of America’s top producing shale regions covered in those initial interviews: the Bakken Shale in North Dakota, the Denver-Julesburg Basin in Colorado’s Front Range, the Marcellus Shale in southwest Pennsylvania, and Texas’ Eagle Ford and Permian shales. 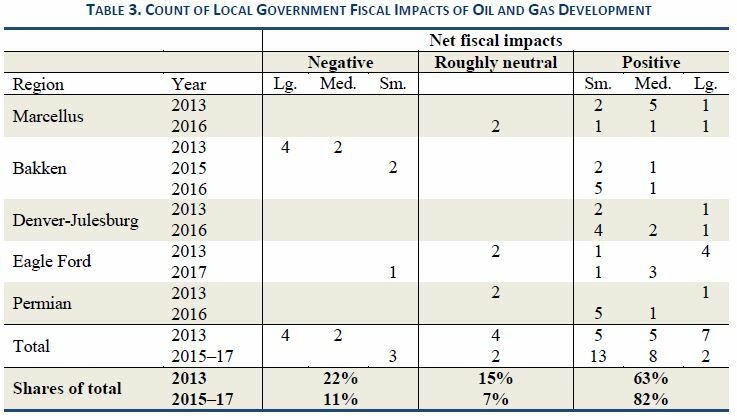 In total, the authors examined a total of 29 local governments – 19 that were previously examined, with 10 new additions – compiling data on a number of fiscal impacts such as tax revenue generated by shale development and in-kind contributions from producers. This trend was observed in other counties as well. 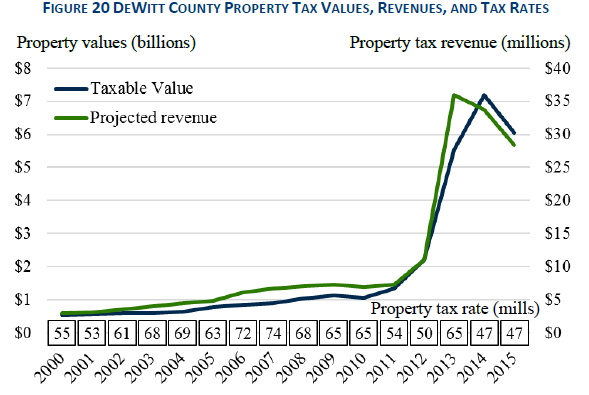 According to the report, growth in oil and gas development in DeWitt County, located at the heart of Texas’ Eagle Ford Shale, helped the county property tax base grow 250 percent, from $2 billion in 2011 to an astounding $7 billion in 2015. This growth resulted in an influx of property tax revenue, leaping from about $7 million in 2011 to over $35 million in 2015. And while revenue has since declined due to the dip in oil prices, property tax revenue is still roughly quadruple what it was prior to shale development in the region. Moreover, these in-kind contributions not only lessen the financial burden facing local governments but also further improve local communities. As the report notes, operators in Weld County, Colo., voluntarily moved “pipeline and other infrastructure at their own expense” to make way for a $160 million expansion to Highway 49, while operators in Pennsylvania spent $1 million on a walking trail to allow for a right-of-way for a new natural gas pipeline. Commodity price fluctuations are an unavoidable reality in the oil and natural gas business, and while the fiscal benefits of development are undeniable during the “good times,” this report shows that even when faced with challenges, oil and gas development still continues to be a vital economic driver in local communities.